I am on a new computer and I installed uBO on it after downloading Google Chrome. 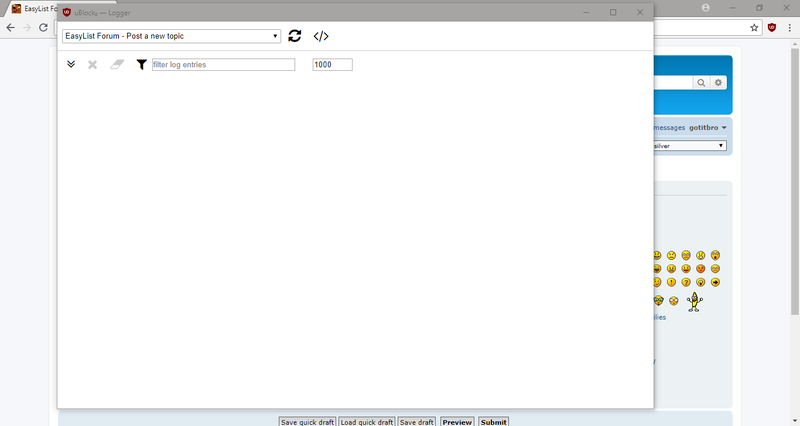 But for some reason the logger window is opening in a new window instead of a new tab. Any reason why this might be happening? I can't seem to get the logger to open in a tab. Same annoying behavior _here_ in new clean profile since several days, it's just that i did not find the time to ask for the why or open an issue. Hold the Shift key while clicking the "Open the logger" icon to toggle between opening the logger in a separate window or in a separate tab. uBO will remember that setting when you open the logger next time, without having to hold the Shift key. Ah that fixed it, thanks @okiehsch. Was the default setting switched from a Tab to a Window? I find the Tab to be much more user friendly rather than a full blown Window pop up. Was the default setting switched from a Tab to a Window? - Default to "Current tab"
I find the Tab to be much more user friendly rather than a full blown Window pop up. Was the default setting switched from a Tab to a Window? I find the Tab to be much more user friendly rather than a full blown Window pop up. ONLY for new installations. No change for existing users.